When I arrived home to a pink leopard print envelope sitting on the mat I immediately knew the contents would be exciting. I mean pink leopard print must mean good things right! 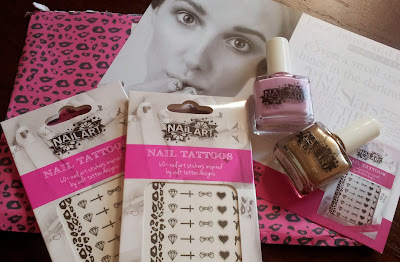 Thankfully I was not let down and the package contained some goodies from Nail Art (part of Skin Art UK). They sent us some nail tattoos and a couple of polishes to try out. The first thing I must admit is that I had never heard of this company before but I'm always happy to try new products. 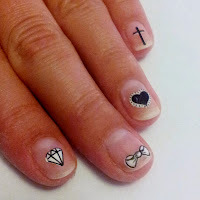 Secondly, I still hadn't got round to trying any nail stickers or transfers, so these were a first for me! I tried the nail stickers first and was pleasantly surprised at how easy to use they were, literally just peel and stick and you're done! I used two coats of Barry M - Matt White as a base as I like the monochrome look with nail decals, and sealed them in with a splash of Seche top coat. As I couldn't choose a favourite I used a different sticker for each nail. The only one I didn't try was the leopard print as that's so easy to do with a nail pen it just felt like cheating a little too much! One thing Nail Art say is that these stick straight away and that is very true, once they're placed you'd better hope they're in the right spot as there's no moving them! 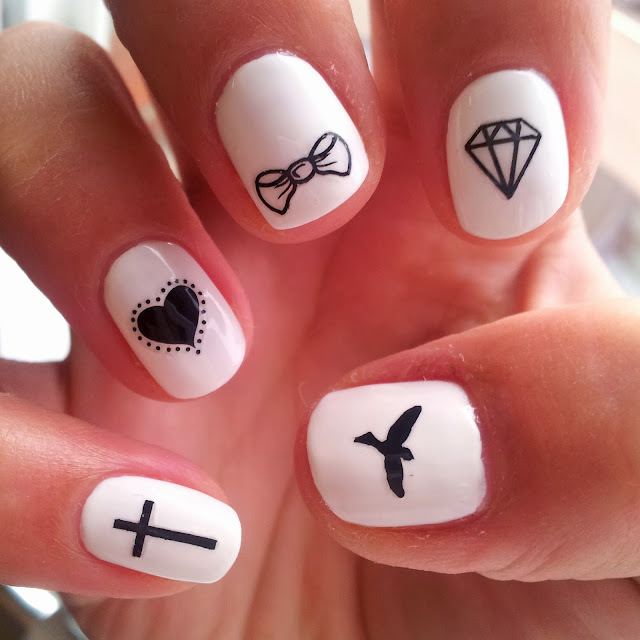 You can buy these nail tattoos here and they cost £5.99. Not super cheap but good fun for a special occasion and you get over 60 of them in each pack. 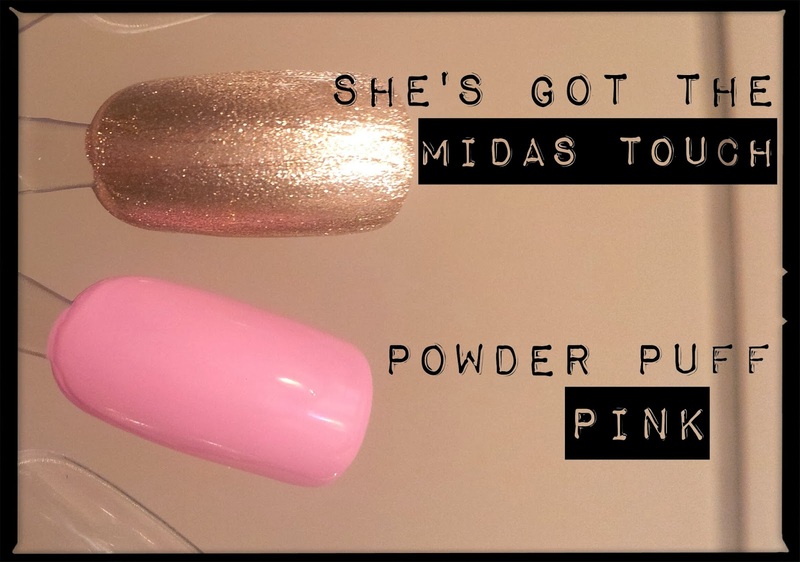 She's Got The Midas Touch is a fantastic metallic champagne coloured polish. The glitter is so dense you have complete coverage in two thin coats. I did find it a bit strange that this polish dries matte, but the shine soon came back when I applied a gloss top coat. Powder Puff Pink is a soft pastel pink. Although still pretty girly, it doesn't have quite the Barbie pink tone to it which makes it nice and wearable. This doesn't dry as matte as She's Got The Midas Touch, but it did benefit from a splash of top coat. The formulas of both polishes are really good and I was quite surprised to find out that the RRP is only £3! Bargain! When I attempted to remove the nail stickers I found that they suffer the same issues as glitter polish! A little bit of soaking though and they didn't take too long to pick off. I took a photie for you as it made me chuckle.